NextThe Day We Almost Lost Da Vinci’s ‘The Last Supper’ Forever! On the other end of the spectrum, Austrian and German warmongers were promoting fear amongst its people, that the rest of Europe was ‘out to get them’. Germany, in particular believed it had to defend its authority as a new leading world power. War was seen as a tool to achieve its aims of expansion, growth and dominance. These were some of the rhetoric and arguments presented to its people. Though, it is believed that in the end, the people of Europe did not have to be fooled or tricked by propaganda to join the war effort. A groundswell of enthusiasm was quite simply aroused by the fact that it was “the right thing to do” or a patriotic duty. 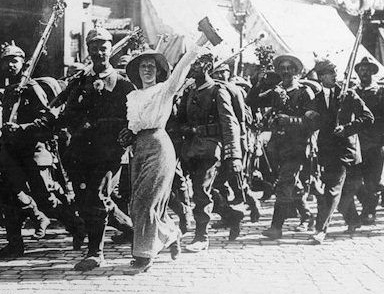 Germans marched to war with flowers in their rifles or stuck between their top buttons of their tunics. Students in Berlin cheer the declaration of war in August 1914. 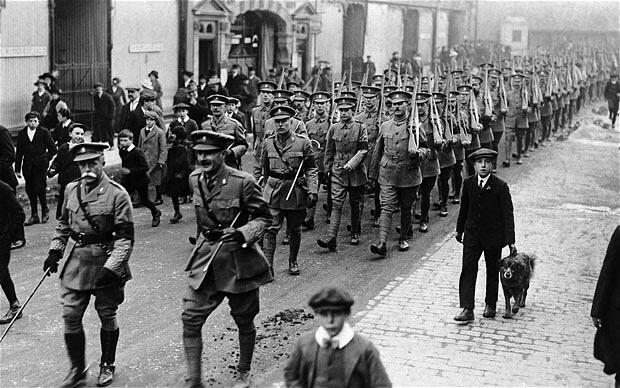 British soldiers mobilising for war in August 1914. Enthusiasm for war across Europe, in particular, Germany was greeted strongest in the cities. Young Germans marched off to battle with illusions of grandeur even arguably with a ‘survival of the fittest’ mentality. In Berlin, the Kaiser addressed a riotous crowd compelling them to unite and pray for their brave soldiers. In Munich, a young Adolf Hitler, who would cause the world so much heartache, oozed with enthusiasm. Across Europe’s other major cities like London and Paris young men viewed war as an ‘adventure’ and a test of their ‘manhood’. In St. Petersburg thousands of men praised the Czar, knelt before Icons and sang Russia’s national anthem. Though in greater rural France there was also a mood of stoic resignation. Nevertheless, people were supportive of their governments as far away as places like Australia. 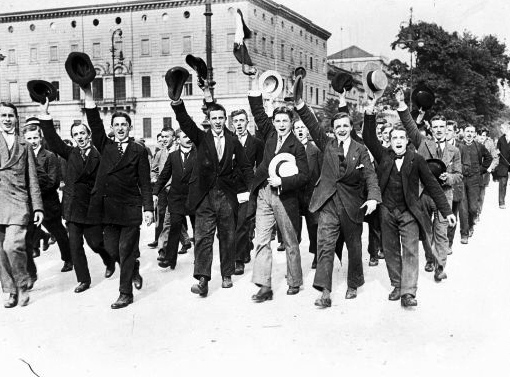 When a cable reached the offices of the Australian Prime Minister and Cabinet about Britain’s declaration of war against Germany, Australian broke out in an unprecedented manner of enthusiasm and support for their ‘mother country’. Germany had initially feared bringing Britain into the war for this particular reason. Its vast empire stretched across the world from India to New Zealand and its populations were keen to help in any upcoming war effort. Mobilisation began almost immediately for Britain’s furthest outposts by ship. Though it would be months before commonwealth countries like Australia, Canada and New Zealand had any impact in Europe, Africa or the Middle East. Though, for instance, Australia’s initial involvement in the Great War was a naval operation closer to home in the capture of German possessions in New Guinea in September 1914. It also made a significant naval contribution when HMAS Sydney destroyed the German raider SMS Emden in November. These expeditionary engagements were a prelude of that was to still to come in the war for Australian forces, a world away on the Gallipoli peninsula in 1915. Canadian soldiers leaving Toronto for the battlefields of Europe during the First World War. 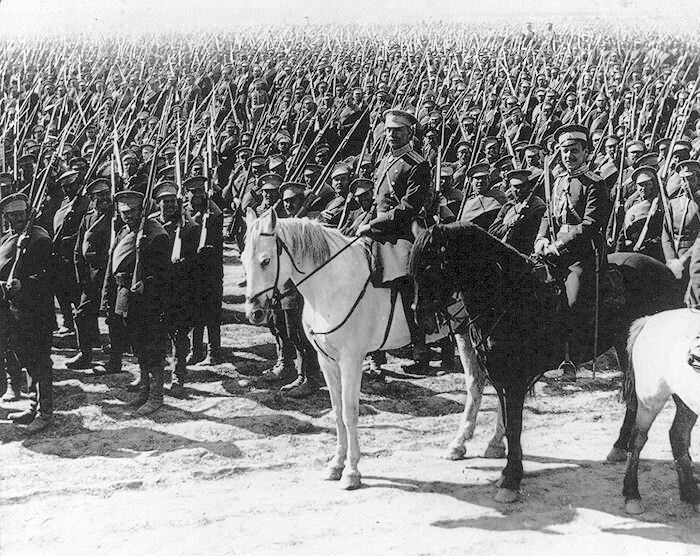 The Russian army swelled upwards of one million men in the opening weeks of the war. They were unfortunately often hampered by problems of mobilisation, poor equipment and training. Mobilisation in Europe was different. It didn’t necessarily mean war at first, as Europe’s Great powers often used mobilisation as a threat (staying within its own frontiers), while at the same time carrying out diplomacy. However, by 1914 something had gone horribly wrong. Mobilisation meant war ? Things had changed. The faster an army mobilised the greater change it had to take the initiative against it enemy. There was a frenzy of movement in the days before (and after) Austria fired the first salvo at Belgrade. Germany reacted first by imposing war on Europe by ‘railway timetables’ by moving against the French first via Belgium, while keeping an eye on the Russians in it rearview mirror. Troop trains delivered millions of men to the frontiers as close as possible. Some of the numbers are staggering, upwards of 11,000 trains departed railway lines of Germany in the first few weeks alone. Along with the trains came eager soldiers, horses, draught animals for the artillery and other transport wagons. The numbers of men mobilized, across all the belligerent powers, in the first week of war was also ‘mind blowing’. Austria, for instance, mobilised 600,000 soldiers, the Germans 715,000 and the Russians upwards of one million men. Britain, initially sent a small professional force of 150,000 but numbers swelled quickly enough, as it realized that it wasn’t going to be no lightning war ! As millions of men began their march, from detrainment points in small rural towns, they travelled many miles each day towards what would be on the western front (at least) the first battles of the war. What lay ahead was the Battle of the Frontiers, the Mons and Austria’s war in the east. Norman Davies, Europe: A History, Pimlico, 1997. Paul Ham, 1914: The Year The World Ended, Doubleday, 2014. John Keegan, The First World War, Hutchinson, 1998. Max Hastings, Catastrophe: Europe goes to war 1914, William Collins, 2013. Norman Stone, World War One: A short history, Allen Lane, 2007. A.J.P. Taylor, The First World War: An Illustrated History, Penguin, 1966. Photo Credit: Every effort has been made to trace and acknowledge appropriate credit. All images are in the public domain. The header image are German soldiers in a railway carriage on the way to the front in August 1914. The message on the carriage reads ‘From Munich via Metz to Paris’. 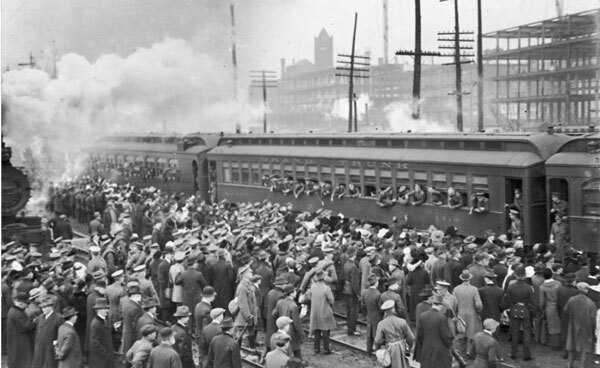 The image of Canadian soldiers leaving Toronto by train is accredited to the City of Toronto. I believe my inclusion of this image constitutes as ‘fair use’ in highlighting a unique historical moment during mobilization of countries worldwide, like Canada during the First World War. Posted in: A history of the First World War.